ANONYMOUS POSTS WILL HENCEFORTH NOT BE PUBLISHED. IF YOU WISH YOUR COMMENT TO BE PUBLISHED PLEASE FURNISH YOUR FULL DETAILS INCLUDING NAME, EMAIL ID, AND POSTAL ADDRESS. THANKS. 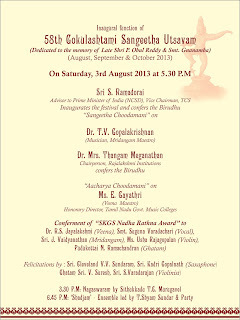 Sri Krishna Gana Sabha will confer the Acharya Choodamani award on eminent vainika E. Gayathri, Hon. Director, Tamil Nadu Govt. 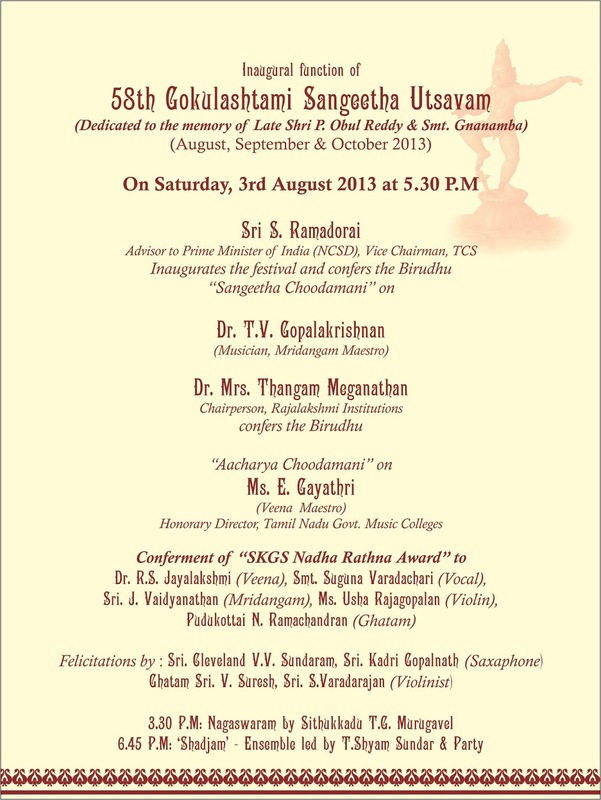 Music College, on 3rd August -- at the inauguration of the annual Gokulashtami Sangeetha Utsavam. The SKGS Nadha Rathna Awards will be presented to vidushis Dr. R.S. Jayalakshmi, Suguna Varadachari, Usha Rajagopalan, and vidwans J. Vaidyanathan and Pudukottai N. Ramachandran. The Executive Committee of the Music Academy has decided to honour Carnatic vocalists vidwan D. Pasupathy and vidushi Kalyani Sharma with the Sangita Kala Acharya awards. The T.T.K. Awards will be presented to Carnatic flautist Dr. Prapancham Sitaraman and to mridanga vidwan Tanjavur Ramamoorthy. The Musicologist Award will be conferred on veteran vidushi Dr. R.S. Jayalakshmi, and the Pappa Venkataramiah Award for Violin will be presented to vidwan H.K. Narasimhamurthy. The awards will be conferred on 1st January 2014 at the Sadas of the 87th Annual Conference of the Music Academy, Madras. 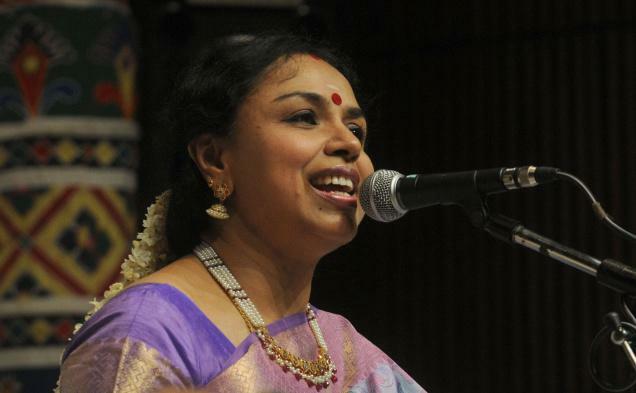 The Music Academy has selected senior Carnatic vocalist Sudha Ragunathan for the honour of Sangita Kalanidhi to be conferred at the end of the forthcoming annual conference during December 2013. 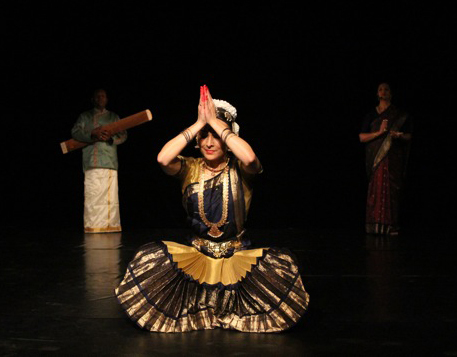 Bharata Natyam guru Chitra Visweswaran has been nominated Natya Kala Acharya, which award will be given away in January 2014. Hearty congratulations to the awardees from Sruti magazine and the Sruti Foundation. (Some months ago, we heard Trivandrum Seethalakshmi—who now lives in Columbus, Ohio—at this very venue. Her student Aparajita, who sang the prayer today, did her proud. Congratulations, Aparajita. He was the pitamaha, the patriarch of Carnatic music. His singing was powerful, deeply moving. His profound scholarship never hampered his creative genius. He was a star in the midst of stars like Ariyakudi, Madurai Mani Iyer, Musiri and GNB. He battled a gruff and nasal voice all his life and managed to produce grand music despite having to fight those wayward vocal chords every inch of the way. Through that gruelling vocal odyssey, it often seemed he was pleading with God, even wrestling with Him as he struggled to overcome his handicap. It could not stop Semmangudi Srinivasa Iyer from becoming arguably the top Carnatic musician of the 20th century. Semmangudi’s imagination is kriti-centred. 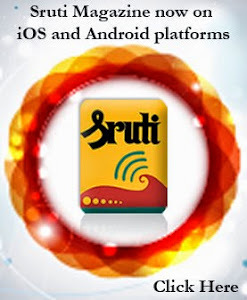 The central piece of reality for him is the kriti, and all other components like raga prastara, niraval and swara go to reinforce and augment the bhava of the kriti. They partake of the compactness and orderliness of the kriti. The mood of the raga is derived from the import of the song. Semmangudi has no equal in bringing out the bhava of a kriti. 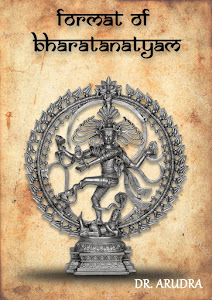 He communicates the feeling and emotion of the sahitya with an intensity that has the imprimatur of a personal faith. His music is not merely brilliant but devout and moving. We all know that Kalki Krishnamurti once accused Semmangudi of ‘murdering’ the text, as in the transformation of ‘Siva, siva, siva enarada’ to ‘Jiva, jiva, jiva enarada’. This attitude to lyrics was surprising in one who spent years editing the compositions of Swati Tirunal, who was in ecstasies over the diction of Muthuswami Dikshitar’s Navavarana kritis. Syama Sastry’s swarajatis bear the Semmangudi stamp, but the accent is on ragabhava. If Ariyakudi shaped the structure of the modern Carnatic music kutcheri, Semmangudi defined its grammar and aesthetics. There was no room for thrills and spills in it; crooning was anathema to him. The Semmangudi influence has been responsible for the dignity and majesty that true lovers of Carnatic music associate with it. According to Semmangudi, his first guru Sakharama Rao was a saint, “though a martinet” when it came to matters musical. When Srinivasan’s adolescent voice broke, it turned so harsh that his uncle advised him to switch to playing the violin. That did not deter the young man. He was determined to conquer his troublesome voice. He practised, practised and practised. In his senior years he was to advise young aspirants to practise, practise, practise. Maharajapuram Viswanatha Iyer treated him like a son and denied him nothing by way of musical exposure. 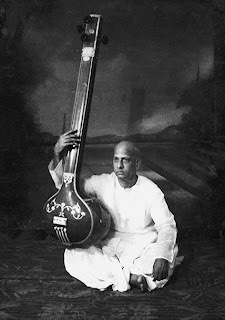 The disciple imbibed much from Viswanatha Iyer while accompanying him on the concert platform, but eschewed his flashy ornamentation and his partiality to Hindustani raga-s.
Once he made his concert debut in 1926, Semmangudi gained much support from senior accompanists. “Ghatam Kothandarama Iyer watched over my music and my conduct,” he said. The venerable Dakshinamurthy Pillai gave him his blessings. His progress thereafter was phenomenal. At 39, he was the youngest Carnatic musician in history to be crowned Sangita Kalanidhi. Semmangudi attributed much of the emotional depth and comprehensive understanding of every raga he explored to the great nagaswaram music he heard in his formative years from such giants as Mannargudi Chinna Pakkiria Pillai, Kumbakonam Sivakozhundu, T.N. Rajaratnam Pillai, Veeruchami Pillai. (He related to an audience at Mylapore’s R.R. Sabha one day in the 1990s the story of how he as a young man used to cross the river to listen to the magical, mesmerising nagaswaram of Chinna Pakkiri—after the piper had imbibed more than the divine spirit. That evening, Semmangudi went on to decry the use of amplification for what was an instrumental ensemble designed for the open air processions of temple rituals. Mikes were his pet aversion. Harikesanallur Muthiah Bhagavatar was responsible for Semmangudi being invited to Travancore to help him edit, notate and publish the compositions of Swati Tirunal. Succeeding Bhagavatar as Principal of the Swati Tirunal College of Music, Semmangudi made a monumental impact on the Carnatic music scene in Kerala. Semmangudi was a generous teacher who trained three generations of sishya-s. Students who stayed at his home, remember his marvellous alapana-s alone at night, usually after a concert. Such was Semmangudi’s veneration for the art he practised that everything he presented on the stage was gold—honed and burnished. Though his alapana and sloka singing showed he could do anything with raga-s, evoke any mood or effect he wanted, Semmangudi did not compose songs, or even set too many compositions to music. “A lifetime is not enough to explore what we have inherited from our ancestors,” he would say. There was little that he did not know about tala, but he thought indulging in showmanship for its own sake was in poor taste. The teacher in him was ever willing to share his knowledge. He taught more by lapsing into self-forgetful raga essays at unexpected moments at home. Fortunate disciples would listen entranced, knowing that they were getting their best lessons. The guru was singing for himself, without the pressures of pleasing an audience, or classroom timetables. His voice performed miracles, because he became unaware of its recalcitrance that plagued him all his life, despite a throat surgery at the height of his career. Semmangudi’s own style was distinct, with an originality firmly grounded in tradition. His school does not permit cloning. M.S. 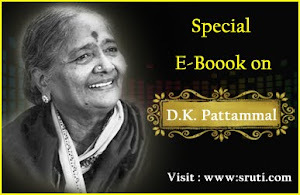 Subbulakshmi is the best exemplar of the kriti structure that his research and practise honed to perfection. In T.M. Thyagarajan we see the undeviating traditionality; violinist T.N. Krishnan combines the purity of ragabhava with imagination; we have heard Kedaranathan render a Sankarabharanam with his guru’s majestic sweetness; P.S. Narayanaswamy delivers enthralling sarvalaghu swara-s in the Semmangudi mould; Seetha Rajan maintains his aesthetics. V. Subramaniam and Palai Ramachandran adhere to the master without imitation. It is also interesting to see how younger musicians like Sanjay Subrahmanyan and T.M. Krishna have adopted some of the veteran’s techniques, especially in swara singing. Visitors to the Semmangudi home were touched by his extraordinary ability to remember their kin. For instance, by sheer coincidence, he happened to know both of this writer’s grandfathers, one a lawyer in Madras, and the other a retired schoolmaster in Trivandrum, as well as other relatives, all of them solid middle class citizens of good repute, but no celebrities. He never forgot them. “How is your Mama, the railway officer? Didn’t your Periappa teach music in Tenkasi? I know your Thatha contributed to the inaugural edition of the Tamil lexicon. I also knew your other grandfather who tutored our Maharaja in Trivandrum.” If all this was an effort to put you at ease, he did it subtly, weaving it in unobtrusively into the conversation. In his final years, death was frequently the subject of his comment, though it was usually referred to with a pinch of humour. He was greatly saddened by the departure of many of his friends, colleagues, admirers and accomplices in rummy, the card game, leaving him ‘waitlisted’ as he used to say. That he made friends for life was well known. These friendships embraced not only the likes of his disciple M.S. Subbulakshmi and her husband T. Sadasivam, but less known individuals as well. When one such lifelong friend, much younger than he, died in 2001, Semmangudi insisted on climbing two flights of stairs to sit by him, lamenting the unfairness of his passing away, while he himself was still alive. At other times, he was not averse to taking a swipe at Yama Dharma Raja. “He came for me last night, but took away my neighbour instead, confused by the old number-new number muddle,” was one of his classics. 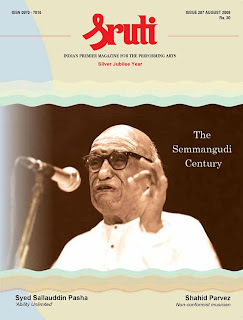 All through his life, and beyond it through the legacy he has left behind, Semmangudi has remained that beacon light for the world of Carnatic music and musicians. And his worthy disciples are keeping his bani alive, disseminating it with true devotion and uncompromising fidelity to his principles. I congratulate the Golden Jubilee celebrations committee and Sri Subramaniam on commemorating Semmangudi’s anniversary in such an exemplary manner—now for the 37th year. My heartfelt felicitations to Smt Kalyani Sharma, by all accounts a role model carrying on her guru’s legacy and spreading Carnatic music with devotion in Mumbai for decades now. It has been a great honour to be here today and speak on the great Semmangudi Mama—it is the equal of an opportunity to speak on Sir Garfield Sobers or Sir Don Bradman. Thank you so much. Those were really golden times of ‘savouring’ Lalgudi Jayaraman’s violin accompaniment for stalwarts in the divine environs of the Navaratri Mandapam at Trivandrum from the 1960s through the eighties. I found his support ‘caring and committed’ for Alathur Srinivasa Iyer, ‘elegant and enchanting’ for Palghat K V Narayanaswamy and so on. None could drift from his sruti-laya anchor and it was sheer delight when Palghat Mani Iyer was on the mridangam. With practically ‘nil amplification’ inside the Mandapam, music of the highest order soaked the oil lamp-lit precincts. Clad in ‘temple dress’ (as we describe it) and sporting his characteristic smile, Lalgudi exuded confidence and offered the best music. My only disappointment is that there was no MDR-Lalgudi combination at the Mandapam. I also used to go to the Bhajanapura Palace to see the great vidwans at leisure and found Lalgudi relishing every moment of his stay at the vintage venue. My father often recollected Musiri’s grand rendering of Smarahari padaravindam (a stellar composition of Swati Tirunal in Sama) at the Mandapam with Lalgudi. Belonging to the next generation, I never had the luck to hear it from Lalgudi at any time even in his solos. But I was really moved when a slice of the song was aired for a few seconds in the Regional News bulletin of AIR, Chennai, when the station reported the news of his demise. Though it was too late, I felt relieved to know that a recording was still available with AIR and that I could listen to the full complement of the song sometime. Will you kindly oblige, AIR? “Great dancers are great because of their passion,” said Martha Graham. So true. It is that passion that keeps us Bharatanatyam dancers going, but ever so often we think of how this great art form can reach out to more people? “Yaam pettra inbam iv-vayyagamum peruga”. I wonder why so much criticism is hurled at us — questioning even the very thread of the divinity in dance? The mediocrity, is it because there are so many dancers, teachers, students… anything goes. But then where are the programmes? Where are the audiences? Is it a profession – in the sense where is the money? We also have some questioning the art form itself! They say it is fossilised, enough of the pining woman, its the same sancharis. Sigh! These thoughts plague me, these questions are constantly swimming in front of my eyes – when are we going to do something about this? Natyarangam, the dance wing of the Narada Gana Sabha, besides organising festivals and natya camps, also has the Jana Bharatham–outreach programmes. The committee chooses a few committed dancers (minimum of three of which one should be a male) to reach out to the community— schools, colleges, institutions — where we either explain the rudiments of Bharatanatyam in an interesting lec-dem format or present a performance — where the concert is tailored to appeal to the audience or we visit institutions, old age homes, where they cannot come out to watch performances. This is an important exercise as it actually widens the base of the audience, it also educates them to understand our art form and also see how it is as appealing or even more than Bollywood or hiphop styles (oh I love the styles). It actually tries to connect the children/audience to our core culture. Under the Jana Bharatham banner, Roja Kannan, Srikanth N and me have done a lot of these outreach programmes. Roja and me have also performed with other artists like Lavanya Ananth,Renjith Babu, Vijna, Kiran Rajagopalan, Uma Nambudripad Sathyanarayanan, Lakshmi Parthasarathy Athreya… we went to corporation schools, and private schools in the suburbs. Recently, a few months ago, Roja, Srikanth and me , we performed at Vishranthi, a home for the Aged, here in Chennai suburbs under an endowment made by Sivasankari, writer and activist to Natyarangam. Under the same scheme, Roja, Sibi Sudarsan and I performed at The Banyan, yesterday, 20th July 2013. The women nurtured by The Banyan are destitutes, people who have been abandoned by families, many of them are also challenged in varying degrees, mentally. While a visit there is a reality check — of how difficult life can be — a visit there is full of hope — hopeful because there are people like Vandana and Vaishnavi (Founders of Banyan) who think about others and not themselves and who make a difference to the society and for these destitutes who are lucky to be housed there and looked after so well. The Banyan at Mogappair houses 180 inmates! Some of the ladies were amazed at how we were dressed – they caressed our cheeks and gave us `flying kisses’. The friendly one gave us a warm greeting. Some of the inmates came to the auditorium — seated and waiting eagerly for us to perform whilst we were setting the stage. We were earlier warned that the attention span may not be for one full hour and that the inmates may wander off. But we were lucky that we had an audience who were rapt and fully involved with what we had to offer. Malathy, an inmate — said she was a Brahmin — and sang along with many of the songs like Chinnanchiru kiliye, Paarukulle nalla naadu, Natanam Aadinar, the Kurathi entry song of Kutrala Kuravanji. She even thanked us at the end saying Bharatakalai had to be nurtured — she is disturbed? Then there was Anuradha who sang and even danced a little for songs that she knew from Bihar, after our programme. The inmates clapped and laughed spontaneously during the kummi, some laughed, some were nodding to the music… unalloyed praises that we three embraced greedily as we don’t get this outside. It made us reflect — Dancers! there is so much for us to do. Lots of people need us—why are we going in circles or squares – looking for opportunities in that sadir? Let us join this outreach movement where we are creating a larger audience base, making people happy at least for that hour, where people appreciate unstintingly. I was moved to tears as I realised that here are people going through life’s vicissitudes while we complain all the time! It is high time that we able-bodied dancers get up and join the brigade to make that difference. Let us create and make use of these opportunities to dance for people, children who have not had a surfeit of it. Sabhas are not the only spaces we need to perform — there are so many avenues for us. Thank you Natyarangam for spearheading this – renaissance? Dr. Sripada Pinakapani has been a Sruti favourite for almost all the time we have been in existence, starting with an extensive tribute to his musical prowess and scholarship we paid in 1983, the year he was awarded the Sangita Kalanidhi title. Though he did not achieve a doctorate in musicology, he was rightly called Dr. Pinakapani for his medical qualifications that made him Chief Surgeon at a government hospital. It was however a frequent misapprehension that Pinakapani had earned the distinction as a musicologist, so profound was his knowledge of his art. His honorific and his reputation as a treasure house of musical learning tended to work to his disadvantage as organisers of music concerts and festivals could not picture him as a performing musician. Even the Music Academy made him only a last-minute offer of a “season” concert opportunity the year he was designated Sangita Kalanidhi. Pinakapani, whose disciples included topnotch performers like Voleti Venkateswarlu, Nookala Chinna Sathyanarayana, Nedunuri Krishnamurthy, Srirangam Gopalaratnam and Malladi Suribabu and his renowned sons the Malladi Brothers, will go down in history as the man single-handedly responsible for introducing the authentic Ariyakudi (or “Tanjavur”) style of Carnatic music to Andhra Pradesh, which before his time, offered a different brand of vocalisation, perhaps not as rigorously orthodox. Internalising the nuances and subtleties of the doyens of the golden era of Carnatic music, he evolved his own Pani bani. Pinakapani was reputed to have understood the different styles of the Trinity and, with devotion, intellect and effort, brought out the quintessence of their compositions in his pursuit of the classical Carnatic music tradition. A selfless teacher, he came to be known in his own lifetime as a Gana Rishi. Pinakapani was born on 3 August 1913 in the village of Priyagraharam in Srikakulam district of Andhra Pradesh. His father Sripada Kameswara Rao was a junior professor of education at the Government Training College in Rajahmundry, and involved in theatre of which, in those days, music was a vital part. Pinakapani sat in his sister’s music class with B.S Lakshmana Rao, who taught drama music in the classical idiom. Starting his own lessons in 1924, Pani completed his music training under Lakshmana Rao by the time he passed out of high school in Rajahmundry in 1929. Saraswathi Gana Sabha in Kakinada run by a zamindar (with some financial support from other landlord patrons) held a 10-day music festival every year. Attending concerts there from 1928 onwards, Pinakapani was exposed to the music of Ariyakudi Ramanuja Iyengar, Kanchipuram Naina Pillai, Papa Venkataramiah, Kumbakonam Rajamanickam Pillai and Tiruchi Govindasamy Pillai. Pani was particularly impressed by Govindaswamy Pillai, Ariyakudi, Naina Pillai and the khanjira-playing of Palani Subramania Pillai. He became pretty good at imitating Ariyakudi’s and Govindaswamy Pillai's music. Finding that the many kritis he had already learnt sounded different from the way Ariyakudi and other outstanding musicians sang them, Pinakapani realised he was now imbibing great music from the Tamil speaking areas of the Madras Presidency. He was barely 16 when he decided to acquire that particular style so that he could establish it in Andhra. The gramophone records of the period often featured padams and javalis rendered by devadasis. Learning these songs by heart, Pinakapani also listened to the Hindustani music of Indubala, Vyas, Bal Gandharva and others on gramophone records and repeated it all flawlessly. He also absorbed the theatrical music of Andhra through his extensive exposure to the stage performances of the day in his father’s company. Thanks to the initiative of his first teacher, Pinakapani soon enrolled as a very young student with violin maestro Dwaram Venkatswamy Naidu. After completing the Intermediate course in Kakinada, Pinakapani spent the summer vacation of 1932 in Vizianagaram. Pinakapani stayed in a small room in Dwaram's house and absorbed the guru’s lessons on raga alapana to the many students gathered there. In 1930, Pinakapani persuaded his Rameswaram-bound parents to leave him at Madras so that he could listen to the December season concerts. Staying at an aunt’s home, the boy listened to Ariyakudi, Flute Swaminatha Pillai and the veena music of the Karaikudi brothers among others at the Academy. From Musiri’s singing, Pinakapani learnt to sing kritis in slow speeds and from Chembai Vaidyanatha Bhagavatar, he learnt how to manage the eduppu or take off in a 4-kalai pallavi. A rare opportunity to listen to Dhanammal’s Friday evening concert at Egmore was to have a profound influence on Pani’s music. “Ariyakudi’s swara kalpana resembles varnams,” young Pani once told Dwaram, "because of his heavy voice, it seemed that there was much raga bhava”. When he proceeded to demonstrate that with a sample of swara-s, Dwaram predicted that he would “go far”. Pinakapani joined the medical college at Visakhapatnam. A hostelmate – who taught him – and he practised music at 4 am everyday in the hostel verandah and on the beach. Pinakapani graduated in 1939. At his first first ‘big sabha’ performance, courtesy a lecturer in his college, the listeners included violin maestro Mysore Chowdiah, who was very impressed. Invited by Chowdiah, Pinakapani went to Mysore, and stayed with him as a houseguest, practising and learning music. Chowdiah regularly accompanied him on the violin as he sang. A Salem Krishna Iyengar version of Inta saukhyamani in Kapi that Pani sang became Chowdiah’s favourite, because it was different from the Tanjavur style. Pinakapani married one of two girls whom their parents had brought to sing before Chowdiah. They were Telugus who had settled down in Madras. The marriage took place in 1940. Graduating at the top of his class, Pinakapani was the only one of his batch to acquire an MD degree. That was in 1945. When he, along with B. Ramamurti, later an eminent neurosurgeon, was not confirmed in the post of Temporary Assistant Surgeon after four years of service (as they were “brahmin”), Pinakapani resigned, and moved to Rajahmundry, where he stayed for two years. There, Nedunuri Krishnamurthy began learning music from him. Earlier, in 1948, Nookala Chinna Sathyanarayana had become his first music student. Back at the Vizag Medical College as Permanent Assistant Surgeon in 1951, Pinakapani was promoted as Civil Surgeon in 1954. Transferred to Kurnool in 1957, he retired there in 1968, after 17 years of service. Pinakapani produced numerous books to help improve the learning process. He composed six varnams on his own and tuned 108 keertanas of Annamacharya in a wide range of ragas. Apart from Sangita Kalanidhi, Pinakapani received the title of Sangeeta Kalasikhamani from the Indian Fine Arts Society of Madras, the award of the central Sangeet Natak Akademi, and the Padma Bhushan. He was appointed as the asthana vidwan of the Tirumala-Tirupati Devasthanams. Dr. Sripada Pinakapani lived at Kurnool until his death at age 99. Even though his health forced him to stay in bed for many years, he never stopped singing or discussing music. The Pani bani lives on in the music of his devoted sishyas. Patri Satish Kumar (mridangam) and Viswanath Nakod (tabla). A jugalbandi featuring Sikkil Mala Chandrasekhar (flute) and Anupama Bhagwat (sitar) with Patri Satish Kumar (mridangam) and Viswanath Nakod (tabla), organised by Sri Krishna Gana Sabha, during the last December season took the audience to a different plane altogether. The audience for jugalbandis includes rasikas who come for the novelty it offers, while there are skeptics like me who feel jugalbandis do not do full justice to either school of music. Expecting the usual Hamsadhwani, we were pleasantly surprised by Mala’s crisp delineation of Nata. Anupama interspersed this with the grammatically similar Jog. Both ladies had some nice exchanges of kalpanaswara for Muthuswami Dikshitar’s Mahaganapatim. The two artists then presented a solo piece each, Anupama played Gurjari Todi, similar to the Carnatic Subhapantuvarali, but without the panchama. She essayed a crisp alap in this raga that induced appropriate pathos, and followed with a few faster sequences similar to jod (tanam). Anupama played two pieces, one in the 12 beat Ek taal, followed by a traditional composition Bhor bhaye in Teen taal. Viswanath Nakod provided excellent support. Mala followed with Bilahari, suiting the morning concert. Following a beautiful yet succinct alapana, she played Tyagaraja’s Dorakuna with creative kalpana swarams that Patri Satish Kumar accompanied impeccably. The main piece of the concert, a ragam-tanam-pallavi (alap, jod, jhala in Hindustani ) followed. We know that Keeravani, a Carnatic export to Hindustani, has the same scale in both schools, but with differing emphasis. It was a pleasure to hear the diverse portrayal of the same raga with each artist bringing out the authentic flavour of her respective style. A fast paced and exciting ragamalika tanam followed with Anupama and Mala alternating with Jaijaivanti, Abhogi, Miyan ki Malhar, Hamsanadam and Sohini. The pallavi in 2-kalai Adi tala (effectively Teen taal) featured sarvalaghu kalpanaswaras with some interesting kanakkus during the koraippu. A thought provoking aural treat followed in the tani avartanam. Patri Satish Kumar demonstrated why he is one of the most sought after mridangists with beautiful variations in nadai, excellent kanakkus and nadam that could not be bettered. Viswanath Nakod’s solo never betrayed the fact that Hindustani music does not have the concept of a tani avartanam. He brought forth the multi-tonal quality of the instrument with well thought out variations. Lalgudi Jayaraman’s Mand tillana was then played in unison followed by a second synchronised piece – a traditional Hindustani composition in Sindhubhairavi, Baat chalat nayi chunri rang. A fitting conclusion. The concert was well thought out and both artists demonstrated what true collaboration is while adhering to their respective styles of music. Unlike many other programmes beset by ego problems, each artist egged the other on to provide wholesome and soul satisfying music. Artists in jugalbandis often traverse schools and meet midway, but this concert demonstrated that both styles could be followed authentically and yet present as an integrated and pleasing whole. One hopes to see this combination more often on the concert circuit. What is tradition in classical music? Art is an aesthetic creation of man. A fine art is a stylized or refined expression of emotions and feelings meant for appreciation by a refined mind (sahridaya). A refined mind is a cultured mind, a mind deliberately cultivated to appreciate beauty in accordance with the principles of good taste. Art music, alias classical music, is not only a fine art, but the finest of fine arts. Good taste governs all music, classical or otherwise. However, classical music differs from music of other kinds in one important respect, and that is in its objectives. The aim of classical music is to evoke aesthetic delight (gana rasa) in the listeners. It is the inherent power of the various formations of the musical notes of a melody mould that creates the emotive experience. The artiste, through his rendering, portrays the varied moods of the melody. The artiste’s expression is the bhava, and the listener’s experience, the rasa. Culture, of which music forms an integral part, is the realm of cultivated tastes, both expressed and experienced. Anything that is both worthwhile and desirable to be preserved, need to be cultivated – be it a crop, habit, behaviour, expression or taste. At any given time, the number of people who have an interest or inclination to cultivate good taste (rasanubhooti) constitutes a small proportion of the listeners. They are the small circle of connoisseurs. Treatises on music term them ‘bahu sruta’ or ‘guni’ -- intelligent rasikas who enjoy gana rasa and appreciate it with a sense of deep understanding. Tradition, in the general sense, denotes a custom, opinion or belief handed down to posterity. In relation to classical music, tradition is governed by expression and experience, portrayal of the bhava of the musical piece and rasanubhooti. Both are affected by the principle of good taste, and together they constitute what is suggested by the term ‘tradition’. All traditions are a function of time. Being a performing art, classical music lives both in space and time. As time itself is a medium of change as well as a measure of its frequencies, no tradition ever remains unchanged in absolute terms. What does not change is the principle of ‘requirement of good taste’. ‘Requirement of good taste’ constitutes the very core of classical music. Good taste is reflected in the quality of music and its appreciation; it demands a high degree of discipline in learning and training, as also in listening. Tradition is, therefore, a continuum of growth and refinement, incessantly reshaping, renewing and revitalizing itself, nourished by the insights and wisdom gained by the practitioners of successive generations. Consequently, at a given time, traditions come to represent the very best of the creative expressions of the gifted exponents and cultural vitality of the societies of the generations that have gone by. In the process of its continuous evolution, traditions assimilate the elements of societal beliefs, philosophy, behavioural norms, and even mysticism, all of which go into making culture composite. Hence, in an ancient yet extant civilization like that of ours, traditions, including musical traditions, have come to be regarded as guardians of cultural identity. It is the dynamics of this continuous process of rejuvenation that is sought to be signified by the cliché ‘tradition and innovation’. In classical music, tradition is synonymous with quality of music and standard of performances and its appreciation. Promotion and preservation of excellence is its very raison d’être. Much of what else that masquerades as ‘tradition’ is ritualistic formalisms, which only tend to perpetuate misbeliefs of the uninformed. It is the exquisite musical creations of great vaggeyakaras and the expositions of those pieces by maestros that keep traditions alive and afloat. Masterpieces of such high standard created centuries ago are models of the harmonious marriage of sound and sense, and hence they continue to entertain, enthrall and elevate connoisseurs of successive generations. Throughout the 19th and 20th centuries, Berlin (Germany’s old and new capital) provided the fertile ground for a truly amazing dialogue with other cultures. Earlier it was marked by some rivalry with other centres of culture and learning, notably Leipzig (still an important hub for publishing, science and music) and Dresden (innovation in dance, music, education and more). Several visits by Rabindranath Tagore to these places proved to be important for Germany’s artistic, educational and intellectual life and vice versa; and this in spite of the inevitable misunderstandings and prejudices seeking to neutralize any innovative venture. 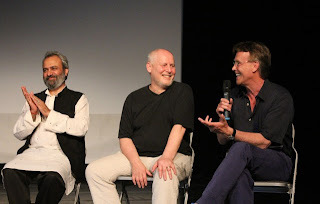 All this came into focus again when Tagore’s 150th birth anniversary was celebrated with exhibitions, conferences, performances and publications in the aforementioned places and, to a lesser degree, all over Germany. Before this background it does not surprise that attempts to rekindle the dialogue with India on eye level is met with enthusiasm and anticipation. With increased scope for travels and communication, this calls for a fresh look at the untapped potential of a special relationship. The Bharatanatyam debut by Eva Isolde Balzer, disciple of Rajyashree Ramesh for over seven years, was an occasion for such a forward-oriented move. For them, completing a traditional “Margam” repertoire and marking it by a formal public debut was more than a formality: it would have to reflect a process of translation and transformation as Eva is already an experienced actress involved in projects exploring the “trans-cultural, trans-disciplinary potential of dance”. The customary handing over of the dancer’s anklets, for instance, became part of the stage dramaturgy in view of the teacher’s modern outlook. This made their teacher-disciple relationship an unconventional one compared to those situated in more traditional Indian society, yet equally special in a different way. Indeed, this special relationship permeated the entire occasion from the dance debut to the follow-up discussions. The warm response of a large audience in one of Berlin’s leading cultural centres left no doubt that presenting a fully fledged dance and live music ensemble under the guidance of Rajyashree Ramesh was worth the enormous organizational effort. The sense of full integration of dance, vocal and instrumental music, which Indian scholars have regarded as key feature throughout the ages, was achieved by singer Manickam Yogeswaran, violinist Senthil Paramalingam, mridangist R.N. Pratap and morsing player A. Srinivasan with Rajyashree Ramesh in charge of nattuvangam. To this her teacher Rajyashree added that “the process of learning is what we wanted to make transparent. That’s why we had this event. (...) I have broken a tabu (...) because all the exoticism is gone if I talk about the pelvic floor.” She explained how her European students couldn’t sit in the aramandi pose as easily as the Indian dancers in her troupe, not being used to sitting on the floor with the open leg-position. This forced her to learn about anatomy, to find out how it works, and then find a way of explaining it to her German students. The performances were immediately followed by a mini symposium at Werkstatt der Kulturen in Berlin titled “Art and Embodiment: Looking beyond Exoticism”. It was meant to bridge the evening’s performance with a longer symposium hosted by the Indian Embassy’s Tagore Centre two days later. The title for the symposium was well chosen considering India’s misrepresentation in Germany whenever the media report on tourism, popular culture and, to a lesser degree, on trade, science and technology. As commercial interests make exoticism all too resilient it is worth subverting it by other means, namely the first hand experience of culture. This revitalizes an unbroken line of mutual recognition and critical reflection India and Germany have shared for over two centuries. The high-level panel included Dr. Avanthi Meduri (dancer/scholar), Rajyashree Ramesh (Bharatanatyam teacher), Ashish Khokar (dance critic/scholar) and Prof. Martin Puttke (ballet director) and Prof. Phillipp Zarrilli (actor/director). After performing a solo dance programme of over 90 minutes, Eva Isolde Balzer (actress/dancer) once again impressed her public, now by her sheer stamina and presence of mind when replying to a wide range of queries. The panel set the pace for an even wider dialogue by involving several members of the audience. Its members not only proved to be keen observers but eloquent commentators on the programme’s interdisciplinary scope. Their diverse cultural and professional backgrounds reflected the host organisation’s reputation: the Werkstatt der Kulturen is a venue best known for a community oriented exchange of ideas, not seldom with political developments in mind. Here prevailing clichés are regularly exposed and analysed while paving the ground for more authentic artistic idioms that suit the aspirations of contemporary artists and their audience. Eva Isolde Balzer is a professional actress working in contemporary idioms and international collaborations. Yet in personal discussions she proves to be fully aware of the potential of “classical” traditions such as Bharatanatyam (which she has studied under the guidance of Rajyashree Ramesh for over seven years), just as the pitfalls of the superficial appropriation of, or identification with any “tradition” – European and otherwise. Such self-questioning may seem to be yet another obstacle in the pursuit of an artistic career yet it proves to be in the best tradition of accountability many younger performers have lately rediscovered both in Germany and India. The combined performances by Eva Isolde Balzer served as catalysts for a special symposium on 24 June. Hosted by the Indian Embassy’s Tagore Centre in collaboration with the International Research Centre of the Free University of Berlin, it brought together scholars and practitioners from India, Europe and the UK to examine global issues relating to Indian dance production, transmission and performance. - How are dancers, dance teachers, choreographers and scholars responding to the changing needs of the global age? - What indeed is the meaning and function of Indian dance in a global world? The symposium investigated these themes within an Indo-European framework and the long history of East/West collaborations linking India with the world. 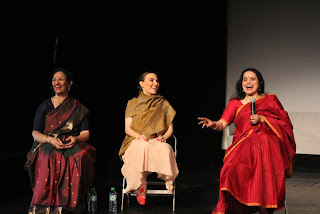 Since this was a practice based seminar, the symposium featured select innovative work by young choreographers using Indian classical dance vocabulary to create new interweaving visions, communities and audiences for Indian dance in a global world. It was sometime in 1982. My father, Vinjamuri Varadaraja Iyengar, called out to me from his room upstairs. I ran up to his room. He asked me, “Do you know to rewind the tape to play a song again?” I said “Yes” and rewound the tape. I had to do that many times that day as he wanted to listen to that particular song repeatedly. It was Sree Venuugopala in the raga Kurinji composed by Muthuswami Dikshitar and sung by Ariyakudi Ramanuja Iyengar. Ever since I heard that song I was captivated by its beautiful melody and realised that the song was composed on the deity of Cocanada (now known as Kakinada in Andhra Pradesh). I longed to visit the temple and see the deity who inspired Dikshitar to compose such a beautiful song. Though I had the opportunity to visit Kakinada when my brother was the Collector there, somehow I was unable to visit the Venugopalaswamy temple. The opportunity presented itself when my elder sisters and I visited Kakinada to meet the Founder and Editor of Ganakala, Munuganti Sreeramamurthy. Ganakala was started in 1962 as a monthly magazine in Telugu, dedicated only to matters musical. Today it is one of the oldest surviving music magazines of India. I was pleasantly surprised when Ramamurthy told me that the temple was close to his house and also the Saraswathi Gana Sabha, one of the oldest music sabhas in the country. It was established in 1904, prior to the Music Academy, Madras, and Gayana Samaja of Bangalore. I was excited that at last I would be visiting the temple and the music sabha that had served as a platform for the performances of all the great musicians of yesteryears and was continuing its service for almost 110 years. The Venugopalaswamy temple was simple yet mesmerizing, small yet powerful, unassuming yet beautiful! The entrance gopuram was very small too, as was the temple with a little shrine of Garuda in the front looking at the main deity Venugopala. 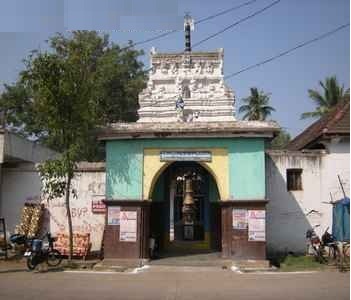 Apart from the main temple in which Venuugopalaswamy resides with Rukmini and Satyabhama on either side, there was also a small temple of Sree Andal. The temple has a plaque describing the sthala puranam to some extent, but there is no mention of Dikshitar visiting the temple anywhere. I did not have the opportunity to contact local music enthusiasts to confirm the year and circumstances for the visit of Dikshitar. Yet, I had the full satisfaction of my visit to that temple as the place which had inspired one of our music trinity to compose a song on the presiding deity there. I was overwhelmed with emotion when I saw the flute playing Krishna. I was happy that my long time desire was fulfilled. Yet, I was sad that such a temple is not in the height of its glory. The tablet (see photo) has a beautiful Sanskrit sloka in Telugu script. Here is an excerpt (a free translation) of the sthala purana as mentioned in the plaque. “Valloori Subbarao was responsible for ‘Rukmini, Satyabhama sameta Venugopala’ to exist in this premises. During the time when he was the tahsildar of this place, Subbarao had a dream one night in which Venugopala appeared and told him that he had to excavate the vigraha buried in the earth there. When Subbarao arranged for the earth to be dug up but could not find the idol, he was totally vexed. The Lord appeared in his dream again and asked him to search thoroughly. This time when they dug deeper, he found a beautiful stone idol of Venugopala with sankha and chakra in both hands and with a ‘makhara torana’. Subbarao then had the idols of Rukmini and Satyabhama made and constructed the temple. For years Kakinada had been the cultural centre of arts in general, and music in particular. The town and its suburbs produced many famous music personalities such as Munuganti Venkatarao Pantulu (great musician), Vinjamuri Varaha Narasimhacharyulu (musician, musicologist, philosopher and author), Kommireddi Suryanarayana Murthy (art philanthropist), Marla Suryanarayana Murthy (Sangeeta Bhushanam, musician) and P.B. Srinivos (playback singer). It was considered prestigious to perform at the Kakinada Gana Sabha run under the title of ‘Saraswathi Gana Sabha’. Only top class performers were invited there (see enclosed invite from 1939). Sri Rama Samajam, a music school founded in 1804 (1894?) had been teaching music to one and all free of cost. It is probably the longest running music school. It was established and run by the Munuganti family for centuries, which deserves national recognition. Unfortunately not many even in the south have heard about the Saraswathi Gana Sabha. As the world has shrunk, travel has become insignificant, and hi-tech has made everything including knowledge accessible to everyone, we must spread our wings and recognise good wherever it may be, and educate and enlighten the enthusiasts. It is heartening to note the improvement in the movements of dancers, the near perfection they often achieve. The tendency to exhibit creativity by staging long sancharis, teermanams and solkattus is however not so enjoyable. Anything overdone loses its charm. True, stage space should be used, but not by wandering aimlessly all over. Such restraint can be observed even in the sarpa nadai. There must be limited use of single hand movements. While following the same kalapramanam from start to finish can get boring, variations in this aspect can help to hold the interest of the audience. Dancers often wear costumes which clash with the colour of the backdrop and the sidewings. There is also a tendency to overdo the make-up. Applying make-up is an art in itself and must be used to suit each dancer. Nothing enhances the beauty of the Indian face like red kumkumam. Modern line drawings on the forehead are best avoided. Very thin eyebrows make the face look placid. Abhinaya, especially to songs on gods and goddesses, and those with a spiritual message, cannot be mundane. The expression should convey the divinity in the portrayal. Children should not be made to dance for songs of sringara as they do not understand its import at a tender age. They can be taught bhakti songs as well as compositions on child Krishna, Muruga and the like, in playful mood. 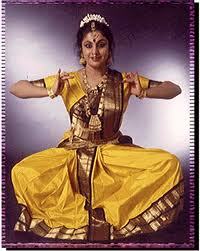 Bharatanatyam has often been described as poetic dance, with smooth transitions between movements. Jerkiness in movements, even in the attami, mars the grace in the dance. It is the dance and the music for it that should attract the attention of the audience, not flashy costumes, jewels, and overpowering props. Gimmicks like blowing smoke and bubbles on to the stage make for a comic spectacle. 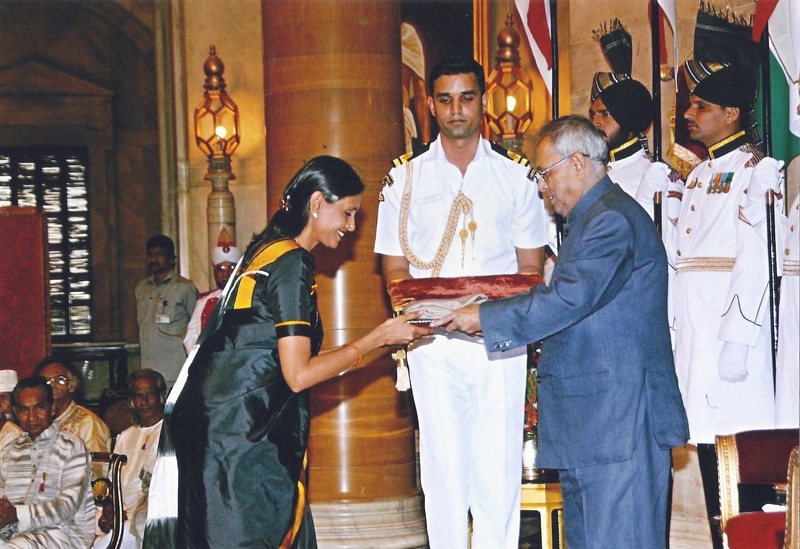 Renowned Bharatanatyam exponent Priyadarsini Govind received the prestigious Sangeet Natak Akademi award for Bharatanatyam at a glittering ceremony held in the Durbar Hall of the Rashtrapati Bhavan. The SNA Fellowships and Awards were presented to the awardees by President of India Pranab Mukherjee on 28 May 2013. In the cultural programmes organised by SNA to feature the awardees, Priya presented on 30th June select items from the margam -- the pada varnam “Sami ninnekori nanura”, the Kshetrayya padam “Indendu vachchitivira”, and the javali “Apudu manasu” a composition of Patnam Subramania Iyer. Priyadarsini is a disciple of eminent gurus -- Kalanidhi Narayanan and the late S.K. Rajarathnam Pillai. We are living in interesting times, when perceptions are constantly being challenged and redefined. The Laksman rekhas that divided generations are blurring, leading to a new dynamic and a synergy that is often amusing. At an Aruna Sairam concert last year, I overheard a conversation between a grandmother and granddaughter. Both of them were obviously big fans of the singer and were discussing an abhang performed by Aruna in great detail. The granddaughter, evidently a serious student of music, was giving her grandmother a mini lecture on abhangs, their history and how Aruna Sairam had revolutionised the south Indian classical music format by introducing abhangs into her repertoire.